Now that you have an account registered for publishing applications through Android Market and a signed application package, you are ready to upload it. 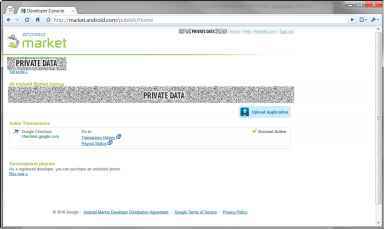 From the main page of the Android Market website, sign in and click the Upload Application button, as shown in Figure 24.3. You now see a form, as shown in Figure 24.4A, for uploading the application package. Figure 24.4B shows the screen allowing the developer to choose which countries to ship the application to. All countries that do not allow paid applications to be exported to are disabled. Choosing the countries to export your application to. ► Application title and description in several languages—English is the default language. ► Countries (locations) where the application will be published—These locations are subject to export compliance laws, so choose your locations carefully. As of this writing, nearly 50 locations are available, and new locations are being added regularly. In addition, you can choose specific carriers for each location to further limit application distribution. Alternatively, you can choose All Locations to include any future locations supported by the market. 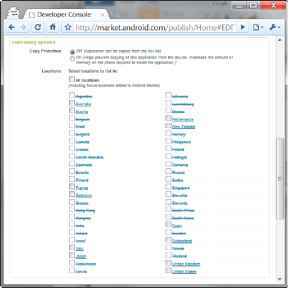 For a complete list of locations where Android applications can be sold or published for free, see http://market.android.com/support/bin/ answer.py?hl=en&answer=138294. ► Application type and category—Spend the time to set these fields appropriately, as defined by the Android Market, so that your application reaches its intended audience. Incorrectly categorized applications do not sell well. ► Application price—The Android Market currently supports only one pricing model: single payment. No subscription model pricing exists yet within the Android Market. You must find other mechanisms in you're interested in recurring payment pricing. 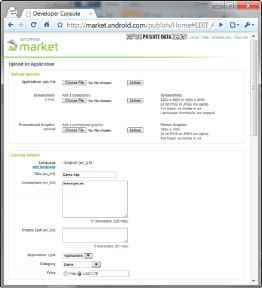 Note that the Android Market currently imposes a 30% transaction fee for hosting applications within the Android Market. Prices can range from $0.99 to $200 USD, and similar ranges are available in euros and UK pounds. Copy protection information—Choosing this option may help prevent the application from being copied from the device and distributed without your knowledge or permission. Support contact information—This option defaults to the information you provided for the developer account. You can change it on an app-by-app basis, though, which allows for great support flexibility when you're publishing multiple applications. Consent—You must click the checkboxes to agree to the terms of the current (at the time you click) Android Content Guidelines as well as the export laws of the United States, regardless of your location or nationality. Be sure to carefully read the details pages (follow the Learn More link) for the export compliance rules. There, Google also links to a couple of U.S. government web pages that provide enough information to know if you'll run afoul of these laws. The application package is uploaded and verified while you fill out the form. Once an application package has been successfully uploaded, the previous information can be saved as a draft, which is great for verification before final publishing. Also, the application icon, name, version, localization information, and required permissions are shown so you can verify that you have configured the Android Manifest file properly.